I can't tell you how happy I am that October has arrived. It is definitely one of my absolute favorite months. 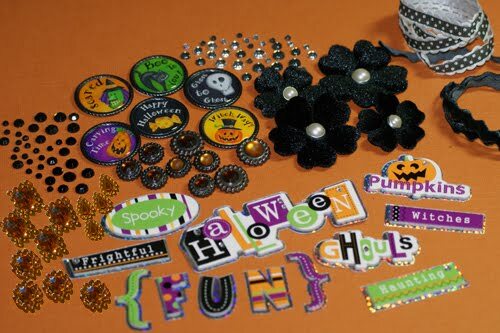 I love the cool chill in the air, leaves changing colors and creating all sorts of Halloween goodies. The funny thing is, as much as I love creating Halloween goodies, I am not real good about giving them away. 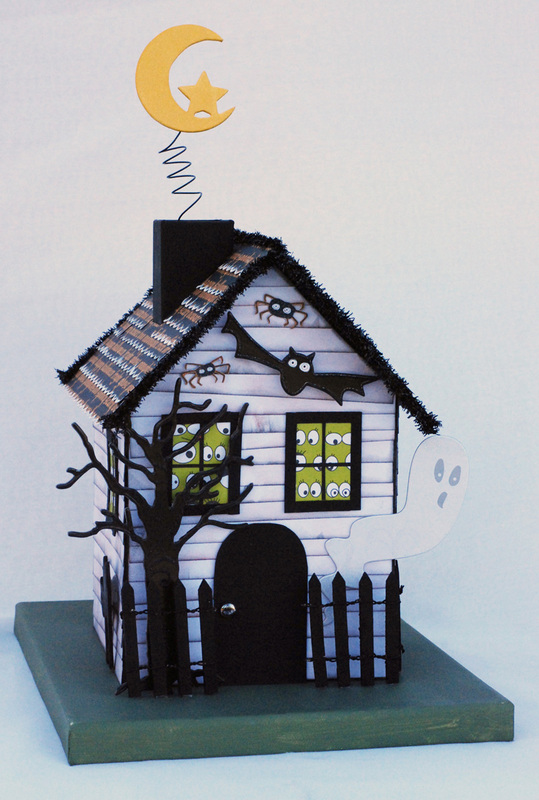 This year I hope to use my stash of Halloween cards. Speaking of creating Halloween goodies, I have a Glue Dots® project to share with you today. 2. Cut strips of white cardstock and ink each strip with brown and black ink. 3. Layer strips on the base of the house using Continuous Glue Lines®. 4. Create windows by cutting thin strips of cardstock and paint them using black acrylic paint. Attach to rectangular pieces of Cup of Eyeballs paper by Jillibean Soup. Cut thin strips of black cardstock to create the panes. 5. Cut door out of chipboard and paint with black paint. Attach silver brad and distress with black ink. Adhere door and windows to front of the house with Craft Glue Dots®. 6. Cut spiders out of Spooky Spiders paper by Little Yellow Bicycle and attach to front of house. 7. 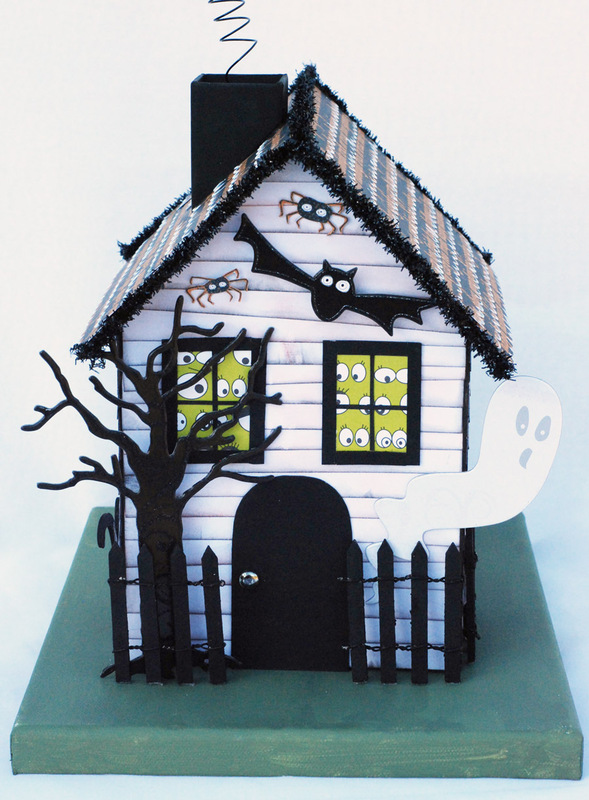 Attach tree and ghost from Boo-ville Chipboard Shapes by Little Yellow Bicycle using Pop Up Glue Dots®. 8. Paint a 5 x 7 canvas using a mix of green and black acrylic paint. Do not mix the paints completely to give the canvas a streaked look. 9. Paint fence with black paint and attach to canvas. I got my fence on clearance from Jeffrey Allen but if you do not have a fence you can make your own. Check out this post for instructions. 10. Create the shingles by using a scallop punch to cut strips of Graveyard paper by Echo Park. Paint edges with white acrylic paint. 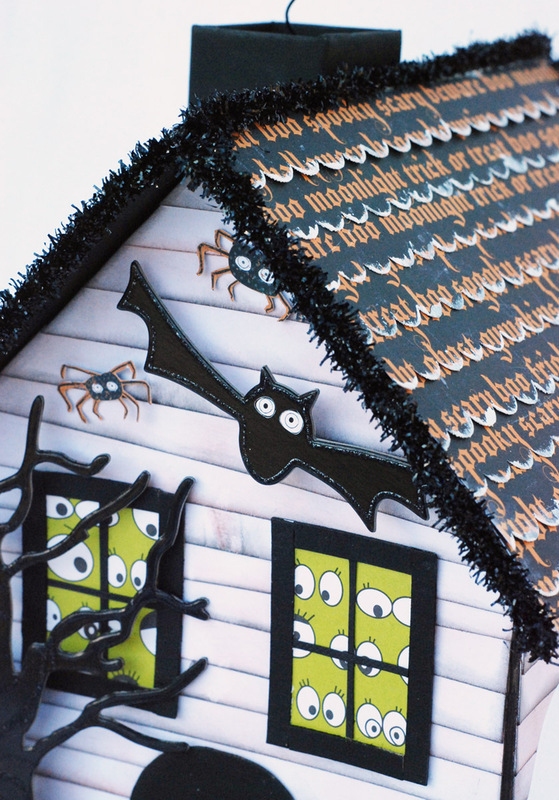 Use Glue Dots Continuous Lines® to attach the shingles and black tinsel to the roof. 11. 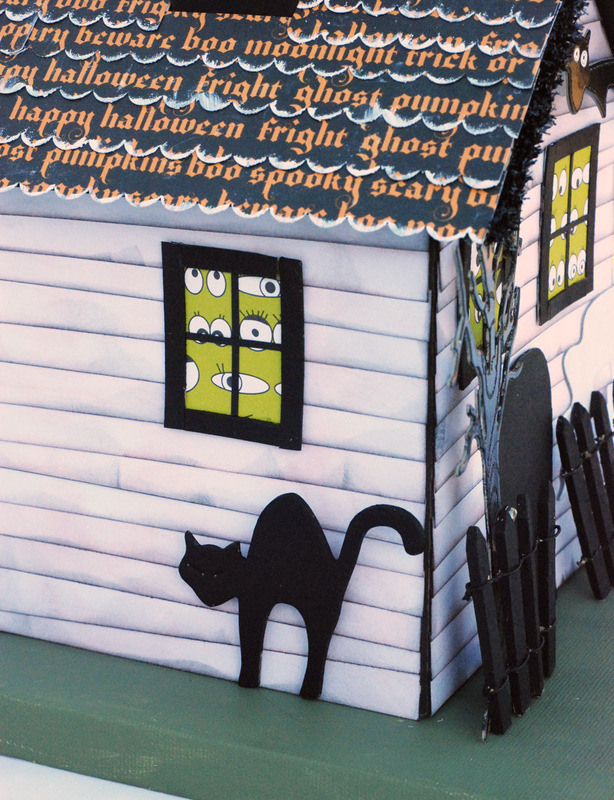 Paint Bazzill chipboard cat black and attach to house with Pop Up Glue Dots®. 12. 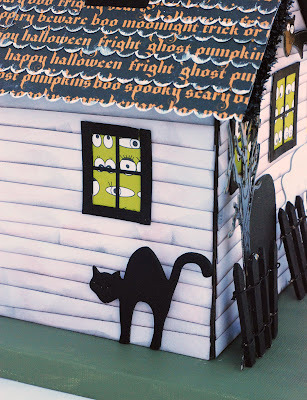 Use yellow embossing powder to cover Bazzill chipboard moon and attach to roof using black wire. I have one other Halloween goodie to share. Creative Charms launching a new kit of the month. 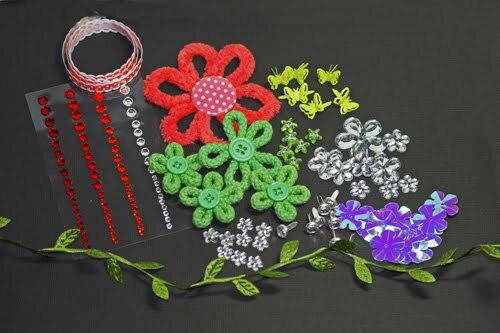 The kit will include new and popular items at a discount. This month’s kit is Vintage Halloween. It will sell for $14.99 (MSRP $20.00). There are two new Deals of the Month for October too. Thank you so very much for stopping by today. Have a fabulous week! Wow, that house is gorgeous! The detail is just amazing. I love your little house! Such inspiration!! !Thanks for sharing! yay! we love october and halloween... what a great haunted house! Oh Lisa!!!!!!!! WOW.WOWOWOWOWOWOWOW!!!!!!!!! !What a fantastic halloween project girl!!! oh gosh is the sweetest! i love every inch of it and don't you LOVE those LYB clear pieces? I love how you used them. Cute projects! I love Halloween, but can't say the same about Fall. I miss Summer, the hot weather, school's out, cute summer clothes and daylight! What an adorable project! Love all the detail! Well it looks like you've got at least one Halloween decoration out! And WOW, is it ever gorgeous! I am digging this, big time! Love the canvas as a base.....that's so clever. And the detail on the house is amazing! 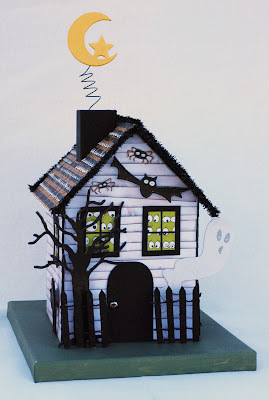 Love the siding you created with strips of cardstock and love the eyeballs in the windows and the spiders and bat. Love it all! Lisa, I just adore this project! Wow! This is just so creative! I LOVE it! 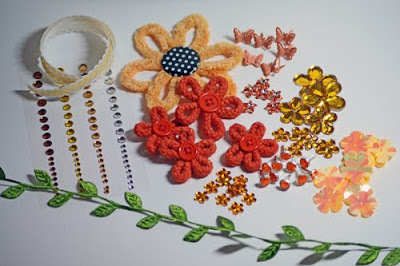 This is such a cool project, Lisa! Love! okay this is just spooktacular. sorry couldn't help it. it really does rock!